Suzanne Collins wrote the Hunger Games, Aldous Huxley wrote Brave New World and George Orwell wrote 1984. All three novels were about dystopian societies of the future. 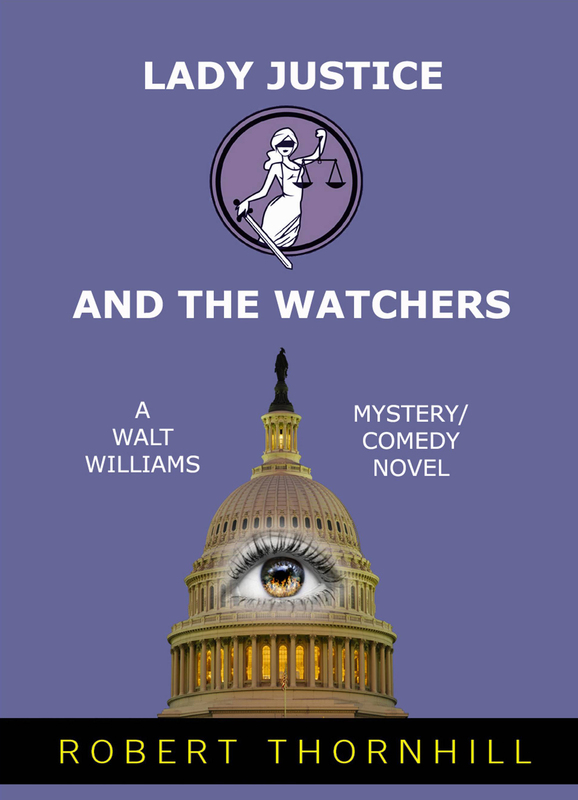 In Lady Justice and the Watchers, Walt Williams sees the world we live in today through the eyes of a group who call themselves 'The Watchers'. Oscar Levant said that there's a fine line between genius and insanity. After reading Lady Justice and the Watchers, you may realize as Walt did that there's also a very fine line separating the life of freedom that we enjoy today and the totalitarian society envisioned in these classic novels. Quietly and without fanfare, powerful interests have instituted policies that have eroded our privacy, health and individual freedoms. Is the dystopian society still a thing of the distant future or is it with us now disguised as a wolf in sheep's clothing? Read Lady Justice and the Watchers and decide for yourself! In 1949, George Orwell penned the novel 1984 about a dystopian society of the future in which everyone is under surveillance by the government. The people are constantly reminded of this by the phrase, 'Big Brother is watching you'. Life in this society is a world of perpetual war, pervasive government surveillance and incessant public mind control. Since the publication of this graphic novel, the term, 'Big Brother' has become a synonym for abuse of government power, particularly in respect to civil liberties, and 'Orwellian' has become the popular adjective to describe official deception, secret surveillance and manipulation of thought to further a totalitarian political agenda. Thankfully, in the sixty-three years since the publication of this futuristic novel, 1984 has come and gone and Orwell's dysfunctional society is nowhere to be seen. For most of us in America, life goes on every day and we are confident in our assumption that all is well in the land of the free and the home of the brave, and that our basic freedoms of life, liberty and the pursuit of happiness are safe and secure, protected by our Constitution and Bill of Rights. Yet, there are those among us who do not share this confidence and believe that it is their duty to watch those who are watching over us, to insure that Orwell's world does not become a reality in our time. For the most part, these 'watchers' are ignored and often ridiculed, for who in their right mind would even suggest that our government's motives and agenda are anything but altruistic. Still, they keep watching and their voices of warning fall on deaf ears bringing to mind the scriptural admonition, "A prophet is not without honor, save in his own country, and in his own house." The most powerful weapon in the arsenal of a totalitarian regime is the apathy of the people it is determined to subjugate. In the final analysis, it is the exercise of our free will both as individuals and collectively as a nation, to insure that our life of freedom and liberty is preserved. To that end, should we not all become 'watchers'?